You probably know that German Shepherds are considered by many to be one of the world’s most beautiful dogs. What you may not know, is that this intelligent working breed can also come in an all-black coat. It’s a striking look, and how the hue is achieved is fascinating. In a way, the Black German Shepherd is almost a mythical creature. When people that aren’t aware of this variant see one, they may mistake him for a mixed breed that contains a bit of German Shepherd in his blood. They may even mistake him for another bread altogether. But rest assured – a Black German Shepherd is 100% GSD. It is not a separate breed, nor has its genes been blended to create a different breed with GSD qualities. In fact, the black GSD is one of several unique color types of the breed, which also include solid shades like white, liver, or blue. Like other uniquely shaded dogs, a Black German Shepherd owes its distinctive color to distinctive genetics. 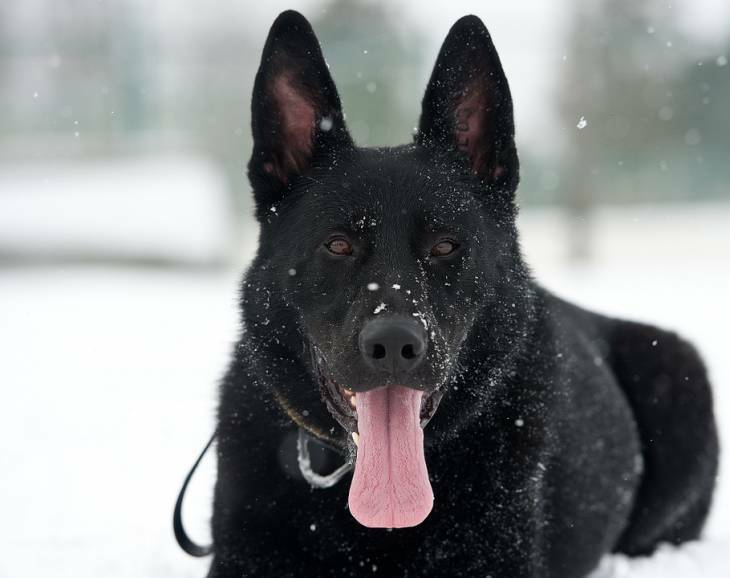 There are two different gene components in play that give black GSDs their distinctive hue – the color gene and the pattern gene. The color gene creates the coat shade while the pattern gene produces secondary colors. In some uniquely colored GSDs like the blue GSD, the color genes are recessive meaning that the color will only show up if there isn’t a dominant gene present. This is not the case when it comes to black GSDs, as black is actually the dominant color. Rather, the pattern gene is recessive. When this happens, a black “pattern” is produced as opposed to a contrasting hue like tan or cream. The pattern is technically still there; it just happens to match the rest of the fur. Now, here’s where it gets complicated. Because there’s a dominant color gene component to a black GSD’s coat, a black GSD that mates with a GSD that has recessive color and pattern genes will produce black GSD puppies. In other words, it’s possible for black puppies to be the offspring of a solid black and solid white GSD mating. There’s No Mistake – It’s a German Shepherd! The black German Shepherd’s coat may throw you off a bit from a distance. But if you get up close to the big buddy, you’ll see some very recognizable traits going on in the face and the body. When you get him to move, you’ll see he moves with the same style and grace as a standard-colored version of the breed. Are There Any Other Physical Differences Between a Black GSD and a Solid GSD? Even though the Black German Shepherd is indeed a German Shepherd, there are still a few subtle differences between the two types. These differences are not large enough to constitute a clear break regarding breed designation. In fact, you may not notice them unless they're pointed out. The first difference is the size of the breed, as the black GSD is larger than the standard. The black GSD’s back is straighter than the standard, lacking the “cringe" that is typical of the standard breed. What's interesting, is that the differences found in the black GSD are more representative of the breed's traditional look? So, How Much is This Unique-Looking GSD Going to Cost Me? Typically, you should expect to shell out $800 to $1,000. This price tag may not be as extravagant as the cost of other “off-color” variants of dog breeds. However, it does come at a cost that can be much higher than your standard, which may be as low as $300 from a reputable breeder. Obviously, you’re going to be paying an extra premium because of the hue. However, as you look for a reputable breeder, you may find it wise to steer clear of breeders that try to sell a black GSD off as “special” deviant from the breed. This may be a sign that they aren’t looking to be as forthright as a breeder should. Before you gather your funds to plunk down on a black GSD, it’s important that you remain cognizant of the secondary costs that may come with owning your potential four-legged friend. Basic expenses such as vet visits, shots, food, and toys can all add up. If you’re not prepared for this, it may hit your wallet pretty hard. You may also have to pay for shipping costs if you have you don’t have a reputable breeder producing black GSDs in your area. There are several pet shipping services that may be available for your use to bring your new pal home. Your breeder may also have a few recommendations for you to consider. The Black German Shepherd may be a little bigger and boxier than your standard version of the breed, but that’s really the only difference you’ll notice about your new friend. Black GSDs carry the same temperament, energy, exercise and nutritional needs, and personality as the “regular” version. Black GSDs are working breeds that live to carry out any kind of job you want to train him to do. This thirst for work is backed up by near-legendary intelligence, making them one of the most professionally accomplished dog breeds on the planet. This allows them to be terrific guide dogs, police dogs, or search and rescue dogs. When he’s not working, a GSD can be an extremely loyal companion to his owner. This trustworthiness allows him to easily lower his guard around the ones he loves, which makes him a terrific family dog. The protective nature that stems from this behavior also makes him an excellent dog around children. Don’t expect your GSD to be a breed that wants to run up and lick everyone that comes into your home, either. While he’s a friendly, easygoing pooch to his family, he tends to be reserved and aloof to people he doesn’t know. This behavior does have its advantages, though – it allows him to be an outstanding watchdog. A GSD’s brainpower makes him an ideal dog for some seriously important work assignments, but it also means that he can be very easy to train. In a way, he’s just hardwired to respond to steady, consistent training. He won’t look at your command as a command – he’ll look at it as a job to do. The drive for constant work also translates into your typical GSD being a high-energy work that is need of constant exercise to prevent him from being restlessness. His yen for activity isn’t necessarily because he wants to run you ragged; it’s simply because getting out and about translates to another job in his mind. In addition to working out your GSDs body, exercise and playtime also help to stimulate his mind. Because these activities tap into his "need to work" nature, a GSD will view any playtime as a way to get his brain working. This will keep him healthy and well-rounded. If you don’t follow through with these essential activities, you may be bringing a world of hurt to your garden or living room. A GSD that doesn’t have something to do may become rather bored and frustrated with his surroundings. He could very well take out this frustration by engaging in some unpleasant or destructive behavior. In terms of destruction, we’re not talking about leaving a few teeth marks on the edge of your arm chair. GSDs have powerful jaws, and they aren’t afraid to show you how mighty their mandibles are in fits of boredom. This kind of negative behavior may be alleviated by the introduction of safe chew toys in addition to regular exercise. And if you’re planning on being away from home for long stretches of time, providing your GSD with toys or other various forms of entertainment while you’re away is especially essential. This is a breed that doesn’t handle being along for long stretches of time. You’d be wise to help him direct his pent-up energy during these times to safe materials. As far as health goes, the GSD is prone to certain diseases and ailments that are relatively common in large breed dogs. The most common of these conditions is dysplasia, both of the hip and of the elbow. The breed is also prone to picking up allergies. However, you can plan on having your four-legged friend for quite some time. The average age range of a GSD is 10 to 13 years. This may not be as long compared to smaller breeds, but it does tend to be on the higher end of large dogs’ lifespans. A black German Shepherd is a breathtaking beast, but a big part of his true charm goes well beyond the color of his coat. This is a loyal, smart, and fiercely protective dog that will never falter at making you feel loved. What else could you ask for in a dog?